We are the owners and residents of No. 17, 18, 20, 23, 40, 42, 43 and 44 Ganley Court, Winstanley Estate, SW11 2EW. We are all freeholders of well-maintained low rise terraced family-sized houses of three and four bedrooms with garden. We believe that the changes being proposed are substantial and that, despite our feelings about the Master Plan having been made clear from the beginning, the rights and needs of the freehold residents of Ganley Court have been neglected and undermined throughout the consultation process. We therefore request further consultation and a revised planning application before this is determined. Detailed planning application: Construction of Block 1 comprising of a leisure centre and 21 and 32-storey tall towers (77 and 120 metres) on the site of York Gardens. These are submitted in detail and are proposed not to be the subject of subsequent reserved matters of approval. Outline Element of the Application: Proposing future demolition of Ganley Court to build Block 14. Due to the size of the application and the fact that planning application documents were still being uploaded on 18/01/2019, we believe that the 21-day reply period starting from 03/01/2019, outlined by Montagu Evans LLP in the notification letter sent out to residents, is not acceptable and this should be extended. There may well be further objections once we have examined all the documents. Core Policies for Issues: Policy IS 3: The Council will protect and reinforce the existing varied character and heritage of the borough. We believe that the proposed development is a direct contravention of these policies. It does not respect local context and street pattern, nor the scale and proportions of surrounding buildings, and would be entirely out of the character of the area, to the detriment of the local environment. Ganley Court is characterised by low-rise, two-storey terraced, family-sized houses. The proposed Block 1 would be only be a few metres away from our properties. The two tall towers of 77 and 120 metres high would completely dwarf and overshadow our homes. The proposal would result in a major loss of valuable green space, privacy and the right to enjoy a quiet and safe residential environment. We believe this to be gross overdevelopment. The proposed development is not beneficial in environmental and landscape terms, to the contrary it would lead to the loss of quality of life for many. The proposed Block 1 is in direct contravention of the above policy as it is in such close proximity to our homes. We would be severely overlooked, resulting in a serious invasion of our privacy. It would take away our right to the quiet enjoyment of our home and garden amenities. We are extremely concerned that the construction of Block 1 so close to Ganley Court will have a negative effect on micro-climate, sunlight, shading and ground level wind canyon effect. We would urge you to consider the responsibilities of the council under the Human Rights Act in particular Protocol 1, Article 1 which states that a person has the right to peaceful enjoyment of all their possessions which includes the home and other land. We believe that the proposed development is in breach of our human rights and would have a dominating impact on us and our right to the quiet enjoyment of our property. Article 8 of the Human Rights Act states that a person has the substantive right to respect for their private and family life. The proposed development of Block 1 would lead to an unacceptable loss of light for Ganley Court residents. The ‘Daylight and Sunlight’ report by GIA identifies the impact to Ganley Court (whole block) as ‘Moderate Adverse for Daylight’. The report is extremely vague and shortcoming in the detail. The report states that 29% of windows will fail to meet BRE guidelines. 30 windows at Ganley Court will experience an alteration in excess of 40% daylight (VSC). It acknowledges that there is individual property variation but fails to give data as to which properties will be most affected. However, due to the immediate vicinity of the towers, it becomes evident that the front and rear gardens, together with all west-facing windows will have a detrimental loss of light, which is simply unacceptable. This is in breach of local and national policies. Once again, we feel that the proposed development of Block 1 makes no consideration for the living standards of Ganley Court residents. Government Planning Policy Statement PPS1, Paragraphs 17 – 19: The Government is committed to protecting and enhancing the quality of the natural and historic environment, in both rural and urban areas. Planning policies should seek to protect and enhance the quality, character and amenity value of the countryside and urban areas as a whole. Government Planning Policy Statement PPS3: Housing, Paragraphs 13-14: Good design should contribute positively to making places better for people. Design which is inappropriate in its context, or which fails to take the opportunities available for improving the character and quality of an area and the way it functions, should not be accepted. LPAs should encourage development that creates places, streets and spaces which meet the needs of people, are visually attractive, safe, accessible, functional, inclusive, have their own distinctive identity and maintain and improve local character. We believe the proposal to contravene this guidance as it is to the detriment of the quality, character and amenity value of the area, as outlined in the points above. We have always supported the wider regeneration of the Winstanley estate but completely reject the demolition of our homes. The proposed demolition of our low-rise family homes in order to build Block 14 is simply unacceptable. We have attended and submitted comments at each of the masterplan exhibitions held by Wandsworth Council and Taylor Wimpey. Unfortunately, this has not been a transparent nor engaging process. Key documents have been withheld and meetings have been more about explaining the masterplan than any kind of genuine dialogue. Most of the comments made by Ganley Court residents were never responded to. Misleading information has been provided. We were initially told that we would not be part of any masterplan and that Ganley Court would not be demolished. The main consultation from 2013 was based on an almost completely different scheme to what is now presented. The main consultation that is most often quoted in the developer reports is a ballot which was carried out between October and November 2013. This consultation simply asked residents to rank several options about how much change they wanted to see on the estate. It did not provide detail, show clear plans and certainly did not discuss the demolition of our homes at Ganley Court. The majority of residents voted for Option 3 ‘Greater change’ without knowing truly what they had voted for. Winstanley Estate council tenants, who occupy over 500 of the approximately 700 dwellings to be demolished, were promised a compensation of £5,300 for disturbance with the assurance of being relocated; in other words, they were made an offer very hard to refuse. 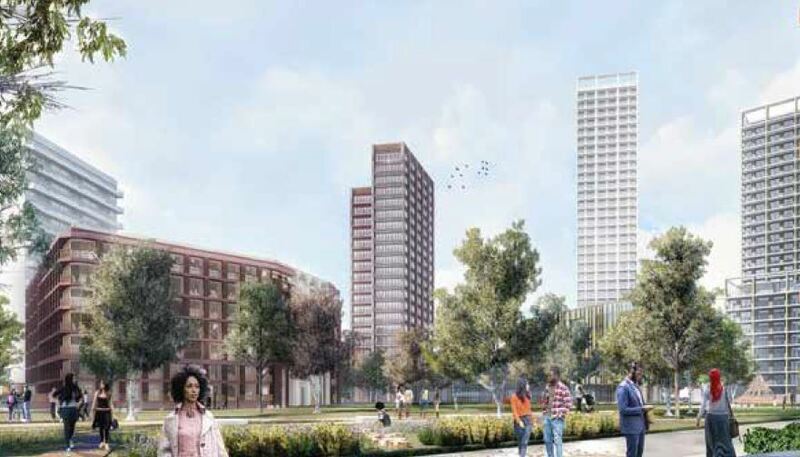 At the 2013 consultation, residents of the Winstanley Estate were asked, “What would you like to change?” A main theme response was “Improved homes with fewer towers.” (Appendix 1). By constructing tall buildings, such as the 21 and 32-storey towers at Block 1, and replacing low rise houses at Ganley Court with the 10-story Block 14, this is clearly not taking into account the feedback from that consultation. Contradicting earlier assurances, the demolition of Ganley Court was proposed at an exhibition in February 2014. Council representatives explained that provisions had been made for Ganley Court homeowners. Designs were shown identifying different sites in the regeneration area for the provision of 10 terraced houses, which replicated as far as possible our current location. We were shown various sketches showing ‘possible locations for new family housing with gardens overlooking the park’ (Apendix 2). We were shown archetypes of other new houses that have been provided through large scale masterplan regeneration schemes in London and the south-east (Appendix 3). Re-housing options will be provided on the same size in terms of bedrooms and type (ie a house) as the existing property. The new houses will be built to the London Mayor’s applicable standards. Having measured the existing properties and compared them with the current standards, this means the properties will be larger overall than existing and will clearly have a much higher energy efficiency rating. The new houses will be built overlooking the re-modelled York Gardens – including those which currently are facing away from the Gardens onto the alley. External amenity space will be larger than current spaces. We have always been supportive of the wider regeneration project so we accepted the idea of being relocated according to the above points in order to facilitate the scheme. We made it clear at the time that we would have accepted the above offer without an Equity Share element. As we own our properties outright, we oppose the idea to enter an Equity Share scheme with a third party. Council officials made a pledge to come back to us on this, but they never did. We continued to make enquiries with Mr Philip Morris and other council officials, but we were told that Master Plan had been put on hold following the announcement of Cross Rail 2 because planning restrictions in the regeneration zone. We were not approached again until the 2017 exhibition that the Council had prepared in partnership with the appointed developer, Taylor Wimpey. This masterplan exhibited in 2017 completely betrayed the previous offer made to the freeholders of Ganley Court. We felt utterly let-down and lost trust in Wandsworth Council and their associates. Policies for Issues: Policy IS 5c: Achieving a mix of housing including affordable housing: On new developments a mix of intermediate (40%) and social/affordable rented (60%) accommodation will be sought. Significant levels of family accommodation will be sought in appropriate locations. The level of affordable housing for Block 14 which replaces Ganley Court is not clearly defined. However, the ‘Development Specification Report’ states that the Outline Elements of the development will deliver 34% affordable homes (includes Shared Equity). No affordable units are being planned for Block 1. The provision of affordable family housing is a strategic priority of the London Plan. Our current properties are fully functional and by virtue are affordable. We feel that we are being forced out of the area and may not be able to buy a suitable and affordable property. There is no supporting study of housing needs and conditions within the Latchmere/ North Battersea area. The applicant seems to ignore addressing these needs and contributing to the sustainability of the wider area. We appreciate the need of increasing demographic density within the regeneration site, but this should not be achieved at the expense of our family-sized accommodation. We are aware that the council has a long-standing policy of protecting houses like ours from conversion into smaller dwellings and in particular those suitable for use by families with children. Protection of our homes contributes to a greater choice of dwelling sizes and prices. Houses like ours can also provide for the needs of professional sharers, adult families and for people who work from home. It is the freeholder’s assertion that the latest proposed Winstanley and York Road redevelopment masterplan by Taylor Wimpey is a violation of our human rights. It would significantly reduce our physical, mental and social well-being if it was given the go ahead. By examining the detailed and outlined planning application, it is clear that the developers and council have left Ganley Court in the last phase of the project for obvious reasons. By the time a detailed planning application will be submitted for Phase 5 of the regeneration, Ganley Court will be surrounded by tall buildings and will therefore be ‘the odd one out.’ This will make it easier for the Winstanley and York Road Regeneration LLP to win the argument over the demolition of our homes. In addition, by leaving us till last and by aggressively building Block 1 on our doorstep, they are certainly hoping that one by one the freeholders of Ganley Court will succumb to the stress, anxiety and loss of quality life, and eventually leave without standing up for their rights. We feel extremely sad and disappointed that after five years of talks, the same very people who pledge to protect the residents of Wandsworth are treating us as if we do not exist and have no rights. The above objections are examined and taken into account when processing the planning application for Phase 1, with particular attention to Block 1 as explained above. The planning application No 2019/0024, also known as Phase 1, will not be assessed for, nor granted planning permission until a constructive resolution is reached with the freeholders of Ganley Court. Winstanley and York Road Regeneration LLP should engage in serious and effective negotiations to address our rights and needs. We are prepared to object to a Compulsory Purchase Order.